Are you feeling the Bern, yet?? 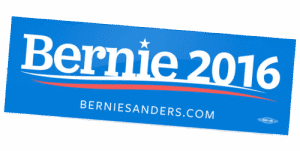 If so, let everyone know you support Bernie Sanders for president with this FREE bumper sticker. To get your freebie, just complete the sample request form. Your sticker should be in the mail within few weeks. You can give a donation if you want, but this is completely optional.